I have written before on the issue of fans giving stick to Gabriel Obertan. On Thursday evening as Obertan put in what I thought was a very good performance, I sat there smugly, feeling for once I wouldn’t be wound up by people booing and abusing Obertan. How wrong I was. Any small error and some fans behind me were immediately on his back and I’m really not sure what Obertan has to do to gain support. I am in no way claiming his performance on Thursday was perfect, he didn’t track back as he should at 3-0, he didn’t take every opportunity he could have done to get past the full back but for me he played well. He beat the full back on several occasions and caused all sorts of difficulties. His assist for the first goal was fantastic. He showed confidence running passed the full back and the ball to Shola was sublime. He seems to be the one player though who can do the slightest thing wrong and he will get abused to a bewildering level. When you compare him to for example Tiote, the abuse is more bewildering. The Ivorian isn’t perfect. I am not saying Obertan is on the same level as Tiote and they are very different players but TIote gives the ball away, often in dangerous areas with his turns etc. Now these are usually graced with groans from the crowd but no-one shouts abuse at Tiote, they encourage him. Now I’m not against players being encouraged but surely we should apply it to all. When Obertan over runs it or gives it away we should encourage him, like we do the more experienced Tiote. A better comparison perhaps is Ben Arfa. At one stage this season no player in the division had given the ball away more times than Hatem. 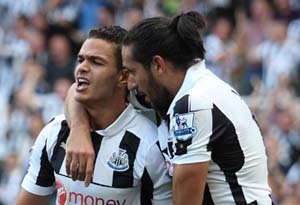 Now Ben Arfa gets away with it because of how good we all know he is. He is the sort of player who you have to put up with him giving the ball away because he tries to create and do something special. Obertan does the same thing, he tries to run at the full back and gives it away, it’s something you have to take with wingers. Obertan isn’t at the level of Ben Arfa but there is potential there. Obertan is also two years Ben Arfa’s junior, the player we saw briefly when Ben Arfa arrived two years ago is nothing like the one we have now, he is more mature and Obertan still has time to develop in a similar way. The other issue the constant criticism must also raise is confidence. For a player who came here at the age of 22, relatively young still, he has been constantly criticised. Any little slip up has seen him criticised and jeered. What sort of affect would that have on your confidence? It would destroy it. One of the criticisms I often hear is the earlier mentioned that he doesn’t attack the full back enough. Of course he doesn’t, the lad could be terrified of the boos so instead of trying to do a difficult bit of skill to get in to a good crossing position he passes back, the limelight is off him and there can be less criticism. I personally feel Jonas doesn’t attack the full backs as much as he should despite having an undeniable talent for it, there is no jeering or frustration aired at him. I am a Jonas fan and he does a great job but if you are going to criticise Obertan, should Jonas not get some too? I am all for players getting the occasional bit of criticism. The issue with Obertan for me is how undeserved the levels are. He is a young squad player who still has years ahead of him where he could become a very good player. He has bags of potential. Compared to the mistakes where Tiote gives it away in dangerous areas, Obertan’s are minimal. Let’s get behind him. Obertan is a player who has impressed in the Europa League so far and has done in the past, if we support him, who knows how far he can go.